I was thrilled to receive an EVEmail of good tidings from Neltharak Idrissil, a supporter of the New Order whom I first encountered some time ago in Halaima. You may recall Neltharak Idrissil from the Shareholder Report #4, in which I recounted how he assisted me in getting some miners to follow the Code after he threatened them with suicide gankings. Neltharak Idrissil sent me an EVEmail to tell me what he has been up to: A mission of mercy in Isinokka. Isinokka is currently outside the claimed territory of the New Order. However, incursions beyond our borders ("ranging" or "going on a range") became legal when I used my emergency powers to declare a Forever War against all highsec in the Shareholder Report #4, after a terrorist group shot at my containers in Kamio. 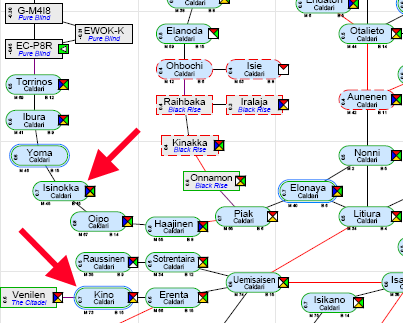 I was curious about Isinokka, and since my ultimate goal is to bring all highsec into the New Order, I looked it up and gave myself a quick geography lesson. 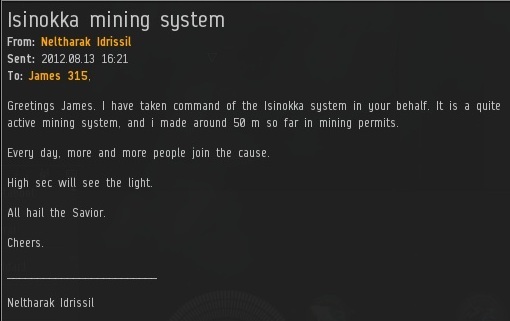 Isinokka is an ore-mining system in Lonetrek, located several jumps away from Kino (the gateway from The Citadel to Lonetrek). For those of you familiar with northern nullsec, the system is just a few jumps away from Torrinos and EC-P8R, the gateway into Pure Blind. Torrinos/EC-P8R is somewhat famous as a nullsec gateway, since it is one of the few areas where highsec directly touches nullsec, i.e. without going through any lowsec systems. Unlike Keberz/HED-GP, where highsec touches a southern nullsec gateway, Torrinos even has stations. 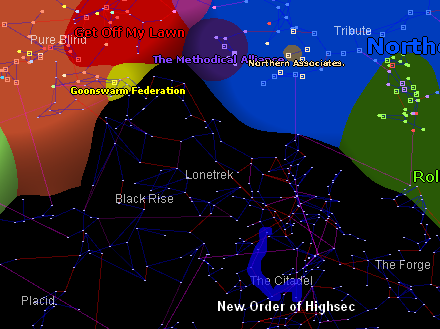 To give you some perspective, here's a segment of the EVE influence map, the most popular map for charting nullsec sovereignty. You'll note its shape differs somewhat from the Dotlan maps; Dotlan maps move things around a little for the sake of readability. As you can see, the Torrinos/EC-P8R gateway is currently held by GoonSwarm, and the Pure Blind region is controlled by their allies. The green arrow up top indicates the location of Isinokka. The middle arrow points to Kino, while the lower arrows are aimed at Halaima and Kamio, respectively. Stop fooling yourself. You're not a saviour or liberator of anything. You're just forcing your own distorted ego on others. And you will never get all of High-Sec under your "Protection". If nothing else, I shall stand up and fight to keep at least one cluster safe from your tyranny. One more thing, Mr. E-Peen-Waver: You claim that people call you a hero. Then prove it. Post solid evidence, rather than stupid, empty claims. You don't have screen-shots that haven't been forged? Thought so. You're not original. 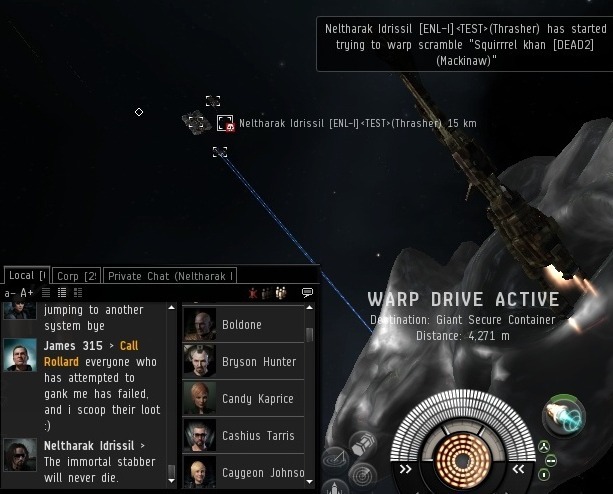 You're trying to act official, but you're really just scared of entering null-sec and fighting for sovereingty down there. So instead you pick on the weak and extort them horribly. Talk about cowardice. I am approving James's work. He IS a hero. Also, you absolutely don't know what you're talking about. High sec miners are not supposed to talk about null. Grow a pair and go there. Who said I'm a high-sec miner? I certainly didn't. I PvP on a frequent basis, but that doesn't mean I approve of that kind of extortion. So if I follow you correctly, what you're saying is... you're super raging gay for man-butts? That's a whole lot of angst over a cursory 10 million per year fee. I can only imagine what would happen if we charged 11 million. A cup of coffee at the gas station costs me about 300 million isk! Thanks Iam Widdershins... now I have to clean up all the coke that I spat out laughing.